Adjust your tracking and rewind your mind for the most radical weekend of your life. Acclaimed cinema eatery Alamo Drafthouse, the American Genre Film Archive and video-worship entity Lunchmeat VHS are proud to announce the very first VHStival, presented at Alamo Drafthouse Raleigh and Video Vortex Raleigh on Saturday and Sunday, October 20 and 21. Two fun-filled and nostalgia-soaked days and nights, VHStival celebrates the glory of the enduring and iconic video format with screenings, special appearances, and analog-driven events. Says Josh Schafer, VHStival creator and Lunchmeat VHS editor-in-chief. "I am absolutely VHStoked to help bring this rewind-inclined bash to life, man! It's all set to be an unbridled explosion of appreciation and celebration in the name of the most radical, ridiculous, and influential home video format of all time. We want to really immerse the crowd in the incredible spectrum of culture that VHS has to offer. We're planning on running a mind-melting array of clips in the lobby to help the fest-goers further explore and discover the wide, weird world of VHS. We're also planning on offering photo ops with some VHS-driven art, and we're even in talks with some local breweries to create an exclusive, VHS-inspired beer especially for the event. We have a bunch of VHSurprises in store for this fest, dude. It's going to be a total blast!" A limited quantity of two-day VHS VIP passes for VHStival 2018 are available now at VHStival.com. VIP passes include access to all VHStival screenings and events, as well as a VHStival goodie bag filled with an array of exclusive goodies like a limited-edition T-shirt, enamel pin, VHS trading cards, stickers, VHS-inspired soap (you read that correctly! ), and more. Tickets for individual shows throughout the festival will be available soon at VHStival.com and drafthouse.com. Says Alamo Drafthouse founder Tim League. "Not only is this weekend going to be amazingly fun, it is also important. 1000s of films were only ever released on VHS and very few people are archiving, protecting and sharing this strange, important and very vulnerable chapter in our film history. In addition to the screenings and parties, VHStival will be infused with workshops, education and initiatives that allow others to get involved with the American Genre Film Archive's preservation efforts." • A fifth anniversary screening of the "Videovore" culture documentary Adjust Your Tracking: The Untold Story of The VHS Collector. • An all-new edition of Found Footage Festival, with unusual and outrageous clips scavenged from VHS collected and curated by Nick Prueher and Joe Pickett. • Experimental film Stand By For Tape Back-Up, created out of fragments of old films, television shows, and commercials by director Ross Sutherland, who'll be present for a live Q&A. • 1988's video store/sci-fi cult smash-up Remote Control, including a live Q&A with director Jeff Lieberman. • Quintessential 1987 shot-on-video meta shocker Video Violence. • 1993's found-footage road trip ripper America's Deadliest Home Video (starring Danny Bonaduce!). • A recording of the 1987 live broadcast of the legendary WNUF Halloween Special and live Q&A with director Chris LaMartina. • A previously unseen director's cut of 1989's surreal sci-fi journey Split. • Visions of VHS, a game show where viewers will experience clips of the weirdest, wildest, and most beloved VHS content, then answer trivia questions about the clips for radical prizes. Each day of VHStival will kick-off with a VHS swap and other interactive events inside Video Vortex, the new video store and bar located in the lobby of Alamo Drafthouse Raleigh. Video Vortex's enormous catalog includes over 75,000 Blu-rays, DVDs, and super-rare VHS titles, and rentals are entirely free. 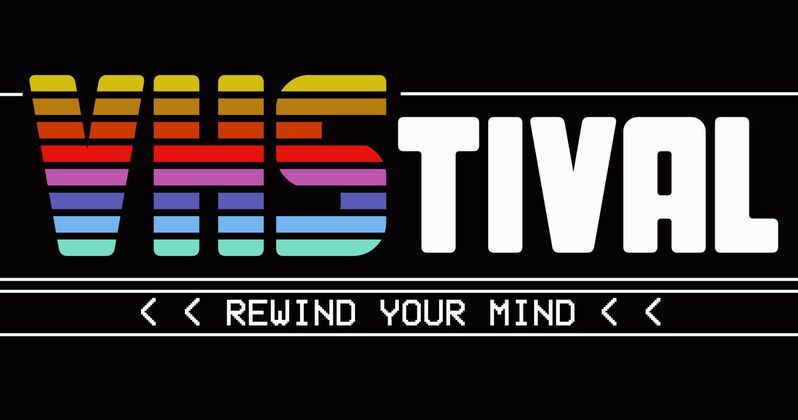 VHStival's interactive events include a VHS troubleshooting and repair station, offering tips and tricks on saving those precious videocassettes, along with FREE professional-grade mold removal to keep all your VHS memories fresh as a daisy! Heavy-duty Videovores can also upgrade their skills by learning how to customize their favorite tapes with the art of spool swapping. Vendor tables for the VHS swap are free of charge, but are extremely limited. Requests for a table can be made at VHStival.com. Meet a cult of small-town psychos obsessed with homemade bloodshed who propagate perverted snuff films via their local video shop. When the town's new video store owner happens across one of the killer cult's videos, he's out to press the stop button for good! Bursting with blood, laughs, and bodacious kills, Video Violence is the quintessential shot-on-video shocker that rocked the rental shelves and violated VCRs across the analog landscape! Includes a special video intro from director Gary P. Cohen! Lost for 25 years, the original found-footage shocker was written and directed by Jack Perez (Some Guy Who Kills People), produced by Mick Wynhoff, and starring Danny Bonaduce (TV's The Partridge Family). Prepare yourself for a rip-roaring ride through the incredibly raw and realistic shot-on-video found-footage shocker that started them all! America's Deadliest Home Video unreels the story of Doug (Danny Bonaduce), an overzealous home video enthusiast who decides to ditch his unfaithful wife for the open road with his beloved camcorder in tow. Doug's troubles triple when he inadvertently records three criminals known as the Clint Dryer Gang deep-sixing their latest escape vehicle. The egotistical leader Dryer (Mick Wynhoff) then abducts Doug, forcing him to record their atrocious blood-spilling exploits and eventually coercing Doug into joining their heinous crime spree, inciting deadly results. Includes a special video intro from director Jack Perez! For decades, obscure film collectors and lovers of esoteric cinema have sought it... finally, the search is over. Originally broadcast live on October 31, 1987, the WNUF Halloween Special is a stunning exposé of terrifying supernatural activity that unfolded at the infamous Webber House, the site of ghastly murders. Local television personality Frank Stewart leads a group of paranormal investigators including Catholic exorcist Father Joseph Matheson and the prolific husband-and-wife team Louis and Claire Berger. Together, the experts explore the darkest corners of the supposedly haunted Webber House, trying to prove the existence of the demonic entities within. Did they find the horrific truth or simply put superstitious rumors to rest? Includes a live Q&A with director Chris LaMartina! Hypnotized by the new display for a mysterious movie called Remote Control, the patrons of a video store rip and swing at each other to rent the new release. What seems like a corny 1950s sci-fi movie turns out to be a brainwashing mechanism, sending the viewers on a murdering rampage! Cosmo (Kevin Dillon) the video store clerk observes the absolute madness and gets the sense that something sinister is lurking on the tapes... and then makes it his business to stop these killer tapes from circulating! A loving send-up of old sci-fi and people's attachment to a new shiny fad, Lieberman's REMOTE CONTROL is the ultimate video store/sci-fi cult smash! Includes a live Q&A with director Jeff Lieberman! A criminally under seen surreal sci-fi journey that you must see to believe! From another dimension, a powerful society of semirobotic humanoids study and manipulate every activity of life on Earth. Their sophisticated interference techniques control our every move, and convince us that our actions are of our own "free will." Amidst the lethargic population, one man will not conform. He alone has the power the break the barrier between the worlds. Starker, a man of a thousand faces, is the embodiment of chaos... and the Authoritarians want him stopped! Starker sees the truth, and the truth will destroy their world! They watch. They control. They destroy. It's time to Split! A special screening of the previously unseen director's cut! They all thought VHS was dead... They were dead wrong! This feature-length documentary investigates and explores the incredible cult of video fiends who are keeping this magnetic medium alive in the wake of the digital takeover. These "Tapeheads" and "Videovores" gather tapes by the thousands, relentlessly scouring countless flea markets, thrift stores, and the deepest corners of the Internet to uncover wild, weird, and super-rare videotapes. Some of these fanatics are known to pay four figures for a single tape! But why? What's the fuel behind this passion? Why is this distinct group of collectors still so rabid to press rewind? The makers of this documentary delve deep into the collective VHS community. This is their terrifying discovery! Fifth Anniversary Screening! Live Q&A with producer Josh Schafer and star Zack Carlson! An experimental film by poet Ross Sutherland that collects fragments of old films, TV shows, and commercials harvested from random VHS tapes. Sutherland rebuilds this motley mixture of clips into an audiovisual meditation on memory, life, death, and reruns, all guided by a fascinating live reading by Sutherland. Includes a live Q&A with Ross Sutherland after the performance! The Found Footage Festival comes to town with an all-new collection of unusual and outrageous clips scavenged from VHS! Nick and Joe guide you through the array of rewind-driven ridiculousness with their distinct brand of comedy and commentary! Includes a live Q&A with Nick and Joe after the performance!